How Does Low Spin With Your Driver Affect the Trajectory of a Golf Ball for Longer Drives? Don Patton began writing after retiring from an engineering career in 2006. He holds a Bachelor of Science in electrical engineering from the University of California at Berkeley and continued with graduate study in software engineering. Imparting spin to a golf ball is critical for producing shots of significant distance and sufficient accuracy. The construction of the ball and the club guarantee a high degree of rotation. Over the years as golf ball and club designs have improved, club makers discovered that for many players limiting the spin on shots with the driver allows them to achieve more distance off the tee. Almost every golf club has grooves cut into its face to grab the golf ball and impart spin to it. Primarily this is backspin, which is rotation around a horizontal axis in the opposite direction to the flight of the ball. Golf balls have dimples on their outer surface in order to grab the air and allow the spin to take effect. While sidespin causes a golf ball to curve left or right, backspin creates lift in much in the same way as air flowing over an airplane wing. Without backspin, golf balls could not stay airborne as long nor fly as far as they do. A ball that didn’t spin or one without dimples to allow the spin to take effect would literally fall out of the sky. Spin determines not only how far the ball flies but also how much it rolls when it hits the ground. Spin rates on some golf shots exceed 5000 rpm, a level that can reduce the distance of a drive by 20 yards or more. With this much spin, the ball rises too rapidly, flies higher and shorter than it should, and then has very little roll. 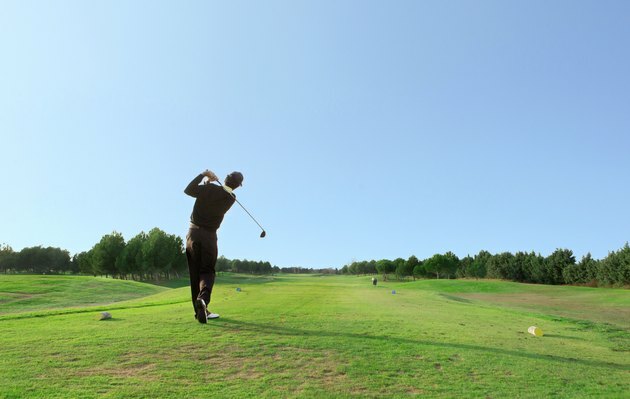 Every golfer’s swing is unique, and variables such as swing speed and angle of attack in particular affect the spin rate. With stronger players, too much spin does limit the distance of a shot with the driver. Slower swingers, however, can actually benefit from equipment that increases the spin rate to add yardage to their drives. Golfers sometimes try to optimize their equipment for maximum distance and control. Many manufacturers provide custom fitting not only for the correct driver loft, shaft type and stiffness, but for the best type of golf ball to use as well. Modern balls with multiple layers can produce different spin rates on each type of shot. The best combination for better players is a high flying, low spinning ball for maximum driver distance and higher spin on iron and pitch shots to produce better shot control and stopping ability. Does Size Affect How a Ball Travels? What Do Half Inch Long Shafts Do to Your Golf Shot?